Besides using images, graphics and text for an enhanced look, one of the most important things is addressing the right target groups. Both can be easily achieved with the KISS Newsletter component. With KISS Newsletter, receivers and newsletters can be sorted in an unlimited number of categories in order to keep a better overview. An association could send different newsletters to their members and their board members, easily separating them by the categories. KISS Newsletter can send personalized newsletters, addressing each receiver individually, following the pattern "Dear Mr Doe, ..." or similar - just by adding the placeholder [address] to the text. Many more placeholders for various information about the receiver can be used, such as postal address, company, phone, website - even an image can be stored. Besides other features, the PRO version of KISS Newsletter offers a special highlight: Target group addressing by interest groups. Newsletter receivers can enter special interest groups voluntarily upon subscribing for the newsletter. The interest groups can be assigned to different newsletters. Before sending a newsletter, KISS Newsletter checks if there are users with the assigned interest groups - not only in the receiver target group but in all other groups as well. Editing newsletters is as easy as pie. 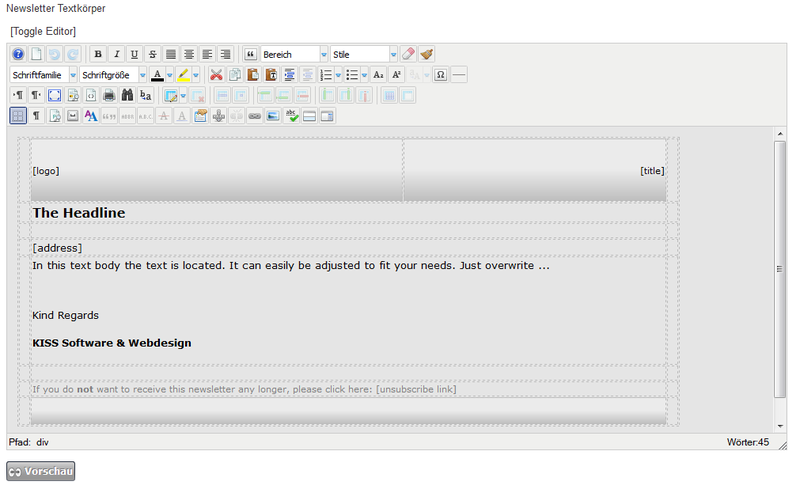 Newsletters can be created by WYSIWYG editor in backend. The editor offers a similar functionality as a text processor and can be operated very simple and intuitive. It follows the same functionality as the Joomla content editing and offers a wide scope for design such as images, tables, HTML etc. 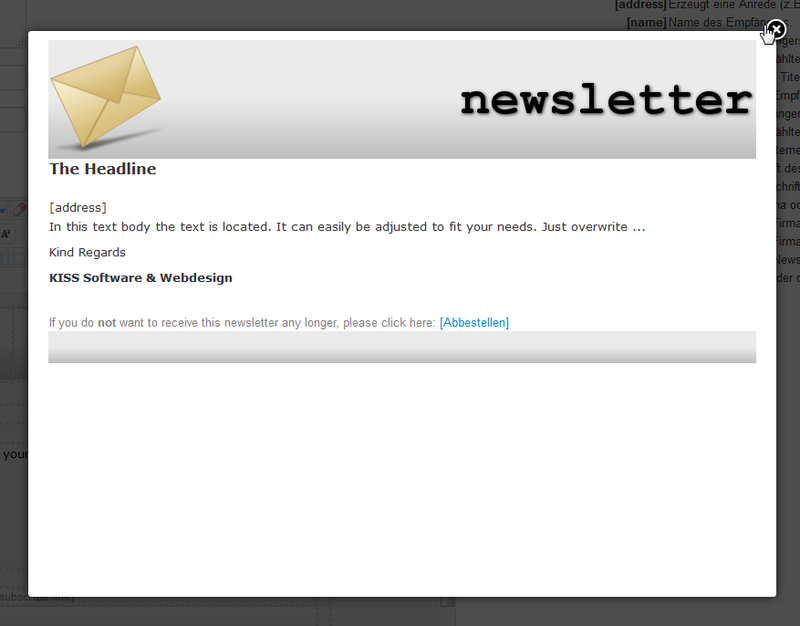 KISS Newsletter can be extended by some ready-to-use newsletter samples from the KISS website. After download they are put into the database automatically and can be edited in backend. Users can save time and development by using these samples. You can download the free GPL version of KISS Newsletter from our download repository.